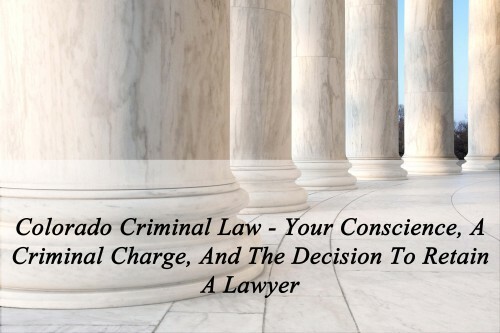 Colorado Criminal Law – Your Conscience, A Criminal Charge, And The Decision To Retain A Lawyer. Why would I need a lawyer if I am guilty of a criminal act? The answer to this often asked and important question, is this: whether a person is guilty or innocent, an experienced criminal defense lawyer can, and most often does. make an important difference in the final result of their criminal case…. as further described in this article. Many people feel that since they intend to plea guilty, there is no need to have a lawyer review their case and represent them in court. The truth is this – firms like mine offer a free first consultation that involves a broad overview of the case. It is during this evaluation that an experienced criminal lawyer might see a possible hole in the case that might lead to a dismissal; see if the changes can be reduced in some way; or locate a mistake or some other error that was made by law enforcement that could help in plea bargaining negotiations or perhaps at the sentencing hearing. The duty of a criminal defense lawyer is not just to defend the innocent of criminal charges, it is to defend those who have committed the crimes charged and are guilty. This is true whether the individual accused of a crime wants to take a case to trial or the individual wants to plead guilty to the crime or crimes charged. It is a duty to make certain that those accused and targeted in the criminal justice system are treated fairly by the criminal courts of Colorado. What follows is a short list of the impact a Colorado criminal defense lawyer can have on your criminal case. First – A Review Of Some Wrong Thinking -” If I Accept Responsibility For My Case And Immediately Plead Guilty To The Charge Won’t The Case End In A Better Result Than Fighting The Case? Certainly it may sound better to you, and it may feel better to immediately walk into court and take full responsibility for the crime which weighs heavy on your conscience. In my opinion taking such a simplistic, black and white position is, most often, a mistake. The idea that if you plead guilty without a lawyer, and without a plea bargain of any kind, somehow the Judge will take pity on you and sentence you to a light sentence is .. in a word.. naive. There is no question that Colorado sentencing judges take into account the acceptance of responsibility and personal accountability at a sentencing hearing – but that is only one fact among many other more important factors that applies in this situation. It is a myth that Judges PUNISH you if you retain a lawyer. Judges know that Defendants have a constitutional right to a lawyer. They actually encourage – especially in serious cases – the use of criminal defense lawyers. Judges expect criminal defense lawyers to study and review all of the evidence in a case before advising their clients of their options. Colorado judge’s know that the presence of a lawyer levels the playing field and makes certain that defendants receive not only a vigorous defense but sound and experienced advice on how to tactically handle the case. Contrary to popular belief, lawyers do much more than attempt to obtain a dismissal of a criminal charge. Colorado criminal lawyers recognize that just because a person may be guilty of doing something wrong – it does not mean their charges have not been “trumped up” or “overcharged.” While a person may or may not have done something wrong – it may also be true that they are NOT GUILTY of the specific crime or crimes charged in their criminal case. The State of Colorado, acting through the prosecutor assigned to your case, may not have the evidence to prove the “elements” of the crime or crimes charged in your case beyond a reasonable doubt. Every crime has various elements that the state must be proven in court before a conviction for a crime can enter – before a person can be found guilty of a crime. An experienced criminal defense attorney understands “the elements” of each crime the state of Colorado must prove and can build a defense strategy based on that law. A Colorado criminal defense lawyer is in a much better position than the person charged – by virtue of their education, their experience, and the detachment needed to make certain justice is done, to achieve a just and fair result forcing the State to meet their burden of proof. In Colorado, the crime of Felony Menacing requires the use of a deadly weapon. 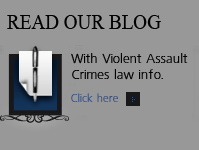 Furthermore for a crime to be “tagged” as a crime involving domestic violence – the State must prove an intimate relationship between the accused and the victim occurred at some point in time. If there was no deadly weapon involved in an altercation with a woman with whom you had a one night stand 10 years ago – it would be a mistake to walk into court, unrepresented, and plead guilty to the charge. Irrespective of the sentence imposed, a lifetime felony conviction would enter and the convicted person would lose MANY, MANY rights including the loss of the right to keep and bear firearms. Let’s assume for a moment have been charged with a DUI or DWAI in Colorado – since the police have a great deal of evidence against you, why not just concede the obvious and plead guilty? Was there a constitutionally based lawful stop of your car? Was there a violation of your rights – such as a search and seizure violation – during the investigation that could lead to the exclusion of that evidence at trial? Are there affirmative defenses or other more general defenses or other grounds for the “suppression of evidence” in your case? Another example, – if yours is a Colorado Violent Crimes case, defenses such as self-defense, defense of property and defense of others, entrapment and the like are complex – and an experienced lawyer may find a way to apply one or more of these defenses to your case. Without at least a minimal review of your case by an experienced Colorado criminal defense lawyer – you will never know if there was a chance to defend yourself against the charges. Furthermore, without retaining counsel you will never know if had a chance to win your case or, in the alternative, whether the best option was to enter into a plea bargain if that is possible. When and if you decide to plead guilty, you have a right to be treated fairly at the sentencing hearing following your plea. 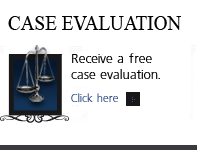 Experienced Colorado criminal defense lawyers can make a very real difference at your sentencing hearing. The factors that must be considered by the Judge at sentencing are complex and the sentencing “decision” by a Colorado Judge is one of the most difficult decisions a Judge is required to execute. Since Colorado law grants tremendous amounts of discretion to State and local prosecutors and Judges also often have tremendous leeway in sentencing, an experienced Colorado criminal defense lawyer will know what the best path to the best outcome of your case. Your lawyer will know the correct strategy to increase the likelihood of achieving the best result at the sentencing hearing. When and if you plead guilty and stand before the Judge convicted of a criminal charge, you will be sentenced for that crime. You can either stand there alone or with a criminal defense lawyer at your side. The Colorado sentencing Judge – as noted above – is required to consider both mitigating factors and aggravating factors related to your case and your particular circumstances. You can provide those mitigating and aggravating factors or they can come from your attorney. Without a lawyer the Judge must hear the “sentencing argument” from you. (e) The crime, the facts surrounding it, or the defendant’s history and character when considered in relation to statewide sentencing practices relating to persons in circumstances substantially similar to those of the defendant do not justify the granting of probation. (n) The defendant cooperated with law enforcement authorities by bringing other offenders to justice, or otherwise. (3) Nothing in this section shall be deemed to require explicit reference to these factors in a presentence report or by the court at sentencing. Can A Colorado Criminal Defense Lawyer Make A Real Difference At Sentencing? An experienced Colorado criminal defense lawyer will have defended thousands of clients at sentencing hearings and will be trained and educated in knowing the factors that are relevant at the sentencing hearing and in their client’s specific case. The Judge’s decision, (in the absence of mandatory sentencing laws), could turn from a sentence to probation to a sentence to prison based on what the Judge hears at the sentencing hearing. Trust me here, a well seasoned Colorado criminal defense lawyer will not only have the ability by education, training, and life experience to explain the possible consequences of the case – he or she may avoid the most serious of all situations – an unforeseen and unwanted punishment. such as jail or prison. There is an understandable urge when a person is targeted by the police investigating a crime – to speak to the police. The thinking is along these lines: “if I could just explain this – I won’t be charged.” The decision to give up your constitutional right to remain silent – to not incriminate yourself – is one of the most serious mistakes you can make during the investigation phase of a Colorado criminal case. It is clear that a person – unfamiliar with the criminal justice system – would never intentionally hurt their defense. The problem is this – even the most innocuous statements can destroy the possibility of using certain defenses that could be raised at trial. The urge underlying the decision to confess does not end the decision to retain counsel – it only amplifies the need for a Colorado criminal defense lawyer. An experienced Colorado criminal defense lawyer may be the only person to successfully attack that confession – testing the legality of the confession – making certain it was voluntarily given and also there was no violation of your Miranda rights. The decision to negotiate a plea agreement when you are guilty of a crime and the evidence against you is overwhelming – is the wisest choice you can make in my opinion. An experienced criminal defense lawyer will have the negotiation skills necessary to seek and obtain the best possible sentence allowed under the law. That same lawyer will advise you of whether the best option – after negotiating to the final plea bargain offer – is to take the plea or to take the case to jury trial. The District Attorney – the prosecutor – has no legal duty to explain your options to you and may or may not tell you about the total direct and collateral consequences of a plea bargain. The DA’s job is not to protect your rights as a defendant – your Colorado criminal lawyer is charged with that responsibility. The Colorado criminal justice system is made up of human beings and because it is based on human decisions – it is inherently flawed. Add to those flaws the complexity of an ancient and ever evolving system of laws completely unfamiliar to the person charged and challenging to the young lawyer and what you are left with a strong need for an experienced criminal defense lawyer to assist you in navigating the system from investigation to sentencing. What About The Opposite Situation? – Do You Need A Lawyer If You Are Innocent? If you are not guilty, the need for an experienced criminal defense lawyer should be in your corner to help prevent the unthinkable. The flaws in this kind of thinking, like the flaws in the criminal justice system – make the underlying premises of this kind of reasoning not only illogical – but dangerous and it is the reason so many people are ultimately convicted of crimes they did not commit. Here’s the truth – once the police have focused their case on you – shifting the focus away from you can be a nearly impossible task. 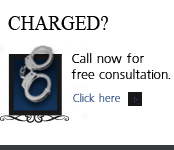 There are clearly some rare situations where a criminal defense lawyer will NOT make a difference – but here is the rub – USE THE FREE CONSULTATION MOST EXPERIENCED CRIMINAL DEFENSE LAWYERS OFFER TO TEST YOUR ASSUMPTIONS AND BELIEFS. In Colorado, never, ever, plead guilty to a crime without discussing your case and your legal options with an experienced Colorado criminal defense lawyer. You should be careful to make a responsible choice in selecting a Colorado Criminal Defense Lawyer – and we encourage you to “vet” our firm. Over the last 30 plus years – by focusing ONLY on Colorado criminal law – H. Michael has had the necessary time to commit to the task of constantly updating himself on nearly every area of criminal law, to include Colorado criminal law and procedure and trial and courtroom practice. H. Michael works hard to get his clients the best possible results in and out of the courtroom. 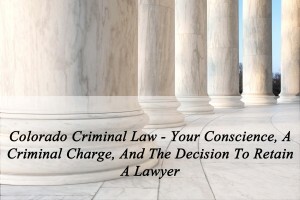 He has written, and continues to write, extensively on Colorado criminal law and he hopes this article helps you in some small way – Colorado Criminal Law – Your Conscience, A Criminal Charge And The Decision To Retain A Lawyer. Why would I need a lawyer if I am guilty of a criminal act? The answer to this often asked and important question, is this: whether a person is guilty or innocent, an experienced criminal defense lawyer can, and most often does. make an important difference in the final result of their criminal case.... as further described in this article.